Autosomal dominant polycystic kidney disease (ADPKD) is a common genetic disease, affecting 1/400 to 1/1000 live births and is the fourth leading cause of end-stage kidney disease in adults. Both types of ADPKD (1 and 2) typically have adult onset of signs and symptoms. PKD was first described in literature in 19th century and the underlying genes for PKD1 and PKD2 were cloned in 1995 and 1996 respectively. The mechanism of cyst formation and cyst growth has been an area of intense research and investigation. Better understanding of this pathophysiology has led to many landmark trials in this field. Here, we will review the more recent major trials which have helped shape our current approach towards management of this disease. The major limitation in developing an effective therapeutic modality has been that creatinine rises late in the course of disease and we lack a sensitive biomarker for disease progression. Kidney volume as a marker of disease progression was looked at in the CRISP (Consortium of Radiologic Imaging Studies of Polycystic Kidney) study in 2006. The authors found that kidney enlargement resulting from the expansion of cysts in patients with ADPKD is continuous, quantifiable, and associated with the decline of kidney function. Higher rates of kidney enlargement are associated with a more rapid decrease in kidney function. Let’s summarize some of the therapeutic strategies that have been studied over the last decade, using kidney volume and glomerular filtration rate (GFR) decline as end points. 1.mTOR inhibitors: There was much enthusiasm among the nephrology community for the use of mammalian target of rapamycin (mTOR) inhibitors for PKD. Data from experimental and observational studies suggested that the mTOR pathway plays a critical role in cyst growth and use of sirolimus or everolimus may slow cyst growth. Everolimus was studied in a 2010 randomized control trial, In a study with 433 patients, it did not show significant benefit on kidney volume or GFR at 2 years. 2. Lower blood pressure (BP) targets: This therapeutic approach was tested by HALT-PKD studies between 2006 and 2014. The HALT A (patients with GFR >60) and HALT B (patients with GFR 25-60) trials studied the utility of lower BP target vs standard BP target and ACE+ARB vs ACE alone in ADPKD patients. They showed that lower BP had a beneficial effect on kidney volume growth. With lower BP, GFR dropped in the short term and recovered or marginally improved in long term. Both left-ventricular-mass index and urinary albumin excretion decreased with lower BP. As expected, dizziness and light-headedness more common with in the low BP group. Dual RAAS blockade was comparable to monotherapy and failed to demonstrate any benefit in outcomes, – though notably dual RAAS blockade did not cause hyperkalemia or acute kidney injury. The study is outlined in the figure below. 3. Tolvaptan: Tolvaptan is a competitive antagonist of Vasopressin (V2) receptor. TheTEMPO 3:4 trial published in 2012 (Tolvaptan Efficacy and Safety in Management of Autosomal Dominant Polycystic Kidney Disease and Its Outcomes) was the first of the two large randomized control trials to demonstrate some benefit of tolvaptan in slowing PKD progression. In a 3 year study of 1445 patients with total Kidney Volume (tKV) > 750 ml and CrCl > 60 cc/min , use of tolvaptan lead to slower annual increase in kidney volume (2.8% vs 5.5%) and slower decline in kidney function. However, tolvaptan had more adverse events related to aquaresis and elevated liver function tests as well as a much higher discontinuation rate (23%, vs. 14). TEMPO 4:4 confirmed these results after 2 additional years of follow up. 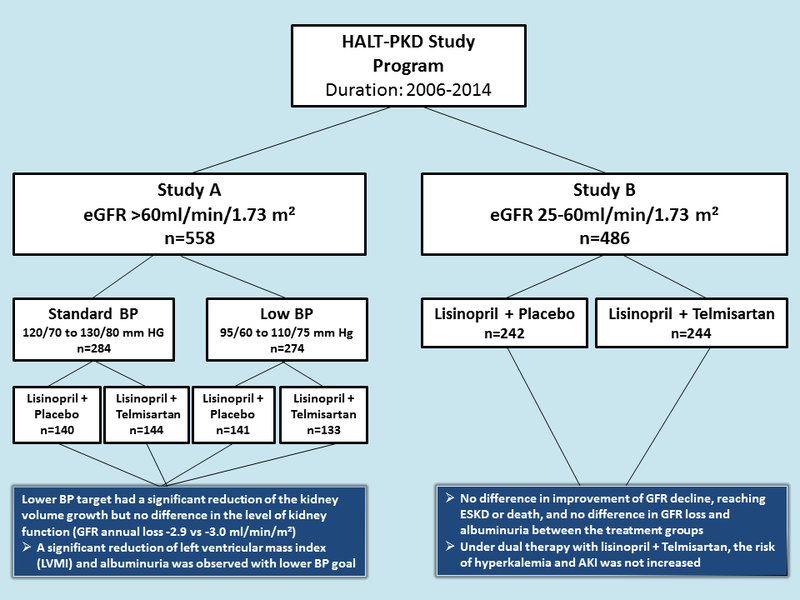 REPRISE (Replicating Evidence of Preserved Renal Function: an Investigation of Tolvaptan Safety and Efficacy in ADPKD) published in 2017, studied tolvaptan in patients with reduced GFR. It demonstrated again the slower decline in GFR with tolvaptan as compared to placebo. 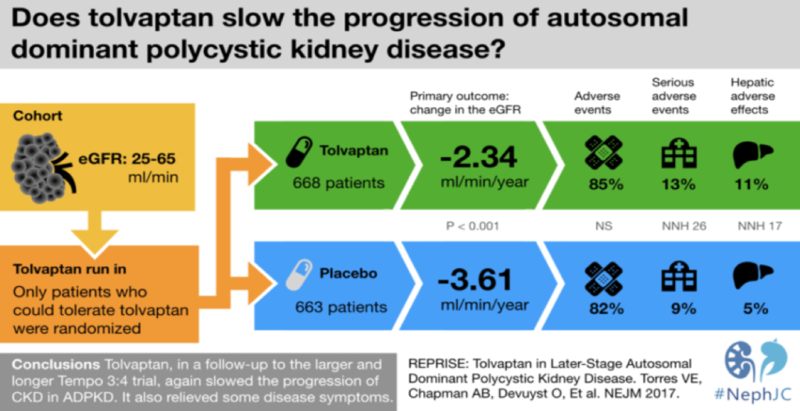 The #NephJC visual abstract above summarizes this study which lead to FDA approval of tolvaptan as the first line treatment to slow renal function decline in ADPKD patients. The long-term effectiveness and its beneficial role in decreasing mortality, progression to end stage kidney disease, and extra renal manifestations of ADPKD are yet to be determined. Find the Spanish version of this post here. 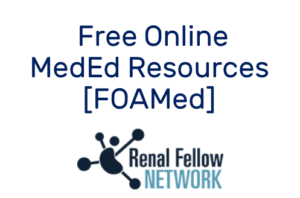 Landmark Nephrology is an online learning tool designed to collect landmark trials in nephrology and distribute content that makes learning nephrology fun and easy. 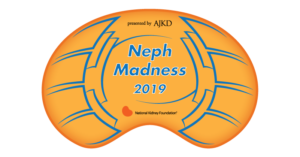 Please visit us to check out our topic-specific content including videos, visual abstracts, quizzes, and a new slide-share portal to facilitate the exchange of educational material within the nephrology community. We love collaboration so contact us as landmarknephrology@gmail.com or find us on Twitter to get involved! in TEMPO trials, what do the numbers stand for?